Continuing with Yellow Wings insignia sheets is this one for aircraft participating in Operation 'Torch', the invasion of Northwest Africa. 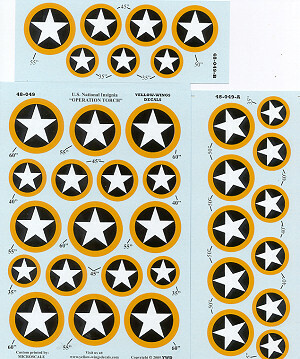 There are basically two sheets with one full and two partials holding insignia that range from 35" to 60". These are usable on any aircraft that took place in the operation. The decals themselves are beautifully printed by Microscale and there is a historical background sheet that accompanies the decals.